Until recently I’ve never really loved bandannas, it was just something I had and wore sometimes. But then I realized just how many bandannas I had and how I have a lot of bandannas, so I decided to wear them all one month. This was in November, so I decided to start in January, starting off the year, and also skipping December since there are so many events that require fancier clothes. How many days are in January? As it turns out, a lot. I’ve never really tried to collect bandannas, I just seem to acquire them. When I decided to do this I had twenty five, most of which I hadn’t even worn. I received several bandannas for Christmas and upon starting the challenge I had thirty nine. My cousin and sister joined in because they thought it would be fun, so the three of us set out to wear a bandanna every day in January. We called it the bandanna challenge, and we started a board on Pinterest to pin ideas, and a Google Hangout to share pictures of our outfits. The rules were fairly simple: Wear a bandanna every day in January. I think at one point we had said something along the lines of having to put it on an hour or something after we got up, but that faded out quickly. My sister only had one bandanna, and we were going to go and buy some more, but it never happened. I, however, had piles of bandannas, so I decided as a rule just for me that I wasn’t going to repeat bandannas at all. 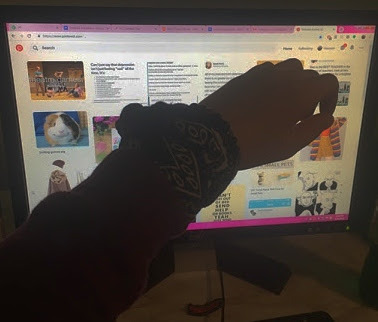 I was going to write about the bandanna I was wearing each day, but I only got like two days in before I gave up, so I’m not going to include those, but I wrote a paragraph the day before I started. I currently have thirty nine bandannas and like four ways to wear them. I am bad at tying bandannas. I have no idea how I’m going to wear a bandanna every day for thirty one days. 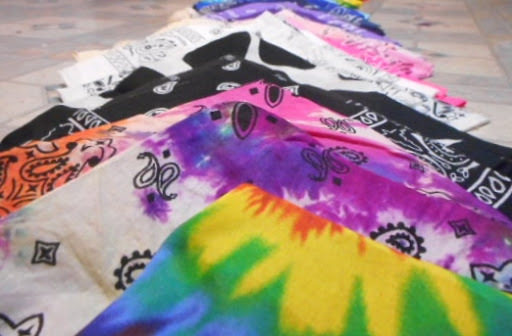 Some of my new bandannas were stiff, and I figured they all could be a bit cleaner so I washed all of my bandannas. Some of the white ones turned pink. I’ll have to bleach them. Most of my bandannas are okay. Bandannas are drying everywhere. I have way too many. One of the main goals was to actually put together nice outfits and look cute, but it didn’t really work. 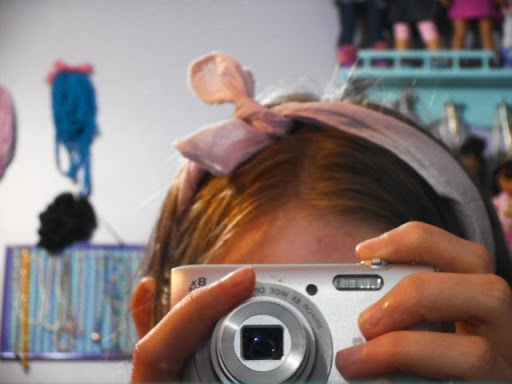 I actually tried to coordinate the bandanna with the outfit sometimes, usually when I had church or drama but I usually just threw on a bandanna with whatever I was wearing, usually tied around some part of me. The first few days were kind of hard, but I eventually got used to it. My cousin dropped out after like a week because her school didn’t allow bandannas, which put her at a huge disadvantage. Apparently bandannas not being allowed in schools is a fairly common thing. Although having my cousin in the challenge was kind of fun it was also cool to have it be a sister thing. We’d lay on the floor and discuss where to put our bandannas, and it was also cool to not be the only one doing it. Made it less weird. As I expected I wore the bandanna the traditional way in which you fold the corners of a bandanna up and fold it up until it’s a strip of cloth, then tie it on the top of your head, the most times. Before I started the challenge I could hardly tie a bandanna, but I got a lot better at it. However I was surprised at how many different ways I managed to wear it. Sometimes people think of cowgirls when they think of wearing bandannas, but I never looked like that. I only ventured into cowgirl territory twice, both times intentional. Five times tied around my ponytail, one of those times it being tied in a bow. Three times wrapped around my wrist, and twice wrapped around my ankle. Twice tied around my hair half up. And then the rest were different from each other, tied around my neck, through my belt loops, folded into a hair bow, as a necklace, around my bun, as a blindfold, braided into my braid, folded into a triangle and tied around my neck, tied around my waist. Then there was the last day. I wore all the remaining bandannas, nine of them, most of them in ways I hadn’t gotten around to. Then my sister and I took the ones I’d worn already and turned them into a skirt. 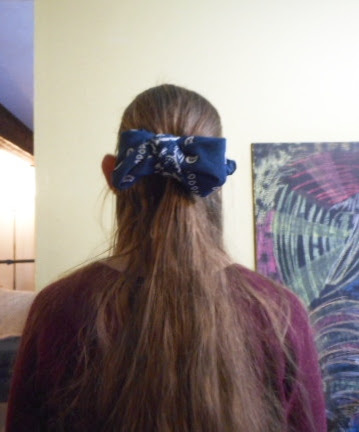 I only wore it for a few hours because it was long and I kept tripping on the bandannas, but it was really cool and fun to twirl in and a great way to finish the bandanna challenge up. So I am officially calling this challenge a success, because I did wear a bandanna every day, and I took pictures every day but one. It was definitely not the easiest thing ever, and I got so sick of wearing them, but it was fun to find new ways to wear the bandannas every day. If you like a challenge and have a lot of bandannas I would suggest doing this for a month. It’s fun and creative. (but also long) If you do, leave me a comment and tell me about it! This entry was posted in Words and tagged bandanna collection, bandannas, how to tie a bandanna, how to wear a bandanna, I wore a bandanna every day for a month, the bandanna challenge. I made a post about how to make a stress ball, which you can read here. Today I decided to follow up that post with a list of what I’ve tried in stress balls and some comments about the filler. If you can’t decide what to put inside your stress ball, or if you’d like some ideas, hopefully this post will give you some inspiration. Flour is the typical thing to put in stress balls. When I have a stress ball people often say “I know someone who made/has one of those with flour in it.” I personally like some of the less typical things better, but flour is still pretty cool. Stress balls made with flour are pretty soft, and you can poke and mold them, and they will usually hold their shape pretty well. Slime is one of my favorite things to make stress balls out of, and it’s also the first thing I did. It’s kind of hard to get in the balloon – I usually stuff it in or oil the funnel first – but I think it’s worth it. If you add fake snow to the slime it makes cloud dough, which is a similar texture to slime but more dough like. If you add foam beads to the slime it makes floam, which is also a similar texture, but kind of crunchy and mold-able. Water beads are super fun to put in balloons. If you add a lot of water the water beads float around, or if you add no water they get all crushed up into a cool texture. If you add just a little bit of water they usually stay whole, but you can still feel the water beads. I like to put a few water beads in a balloon and then fill it up with water and let them grow, then see how it turns out, but for more control you can grow them in a water bottle and then add water if you want, and put them in the balloon from there. Fake snow, or instant snow as it is often called, feels kind of like warm snow. If you change how much water you add the texture is different. You can buy fake snow, but it’s also the stuff you can find in clean diapers if you cut them open. We had a few from when there were little kids in the house, and I just cut them open and use that. Ooblick (Cornstarch and water) is kind of messy to get into the balloon, and after sitting for awhile you have to play with it a bit to mix the cornstarch and water together, but after that’s done it feels really cool. You can squeeze it till it’s hard and then it will return to it’s original shape. Chia seeds are pretty easy to get into a balloon with a funnel, and pretty fun. The texture is hard to explain, but it’s one of my favorites. They all feel about the same, but you can make the salts different colors. The cocoa is more powdery, and it smells really good, but it’s kind of expensive to put in a balloon. They all feel kind of lumpy. They usually aren’t anyone’s favorite, but they aren’t the worst. When people are guessing what is in a balloon they often guess water. I don’t put just water in a balloon because I think it’s boring, I add it to cornstarch, orbeez or fake snow, or sometimes I’ll do one with water and glitter. These all made a mess. Some people like the toothpaste ones, but it wasn’t really worth it. The shaving cream was cool, but it deflated after about a day. The balloons I made with these were really light and felt like there was only air in them, but when you squeeze them they crunch. My mom wouldn’t touch them, and no one else particularly likes them either. I made one with pine needles because I thought it would be cool, but everyone hated the texture. The two I made ended up selling at my craft sale actually, (They were the only two left) but no one really liked them. Then I made one more because why not, and then I put a yellow balloon on it and drew a bumblebee, so that it “stings” you. It was cute, but people don’t like the texture. These just don’t really work. I got the idea from a bottle with water and oil in it sitting on my desk. I like to turn it upside down and watch it. So I thought if I put it in a clear balloon it would have the same effect. Well it was really cool, but I had colored the water with tie dye, and when the balloon popped, the oil and tie dye got everywhere and made a huge mess. So it was cool, but I didn’t think it was worth it. So there’s my list. If you still can’t decide I would start with water beads or chia seeds, which are two of my favorites. If you have any questions leave a comment and I’ll try to answer it! This entry was posted in Words and tagged chia seeds, floam, how to make a stress ball, ultimate list, water beads, what to put in a stress ball. I’m sure there’s some science to stress balls, but I just know they are cool. It helps to squish one while you are stressed, or fidget with one during something long, and they are also great things to give people when you can’t think of anything else. A few years ago one of my friends came up with the idea to put some slime in a balloon and it was really cool. A few months after that we made a few more, and soon I was making a bunch. I love to experiment with things to put inside them. Every year my drama group does a craft sale, and for the past three years I’ve sold stress balls. It’s fun to show them to other people, and they are cheap enough that they sell pretty well. My friends love to guess what’s in them and they always ask how I made them. So I thought it would be fun to show you how to make them. First of all, find some balloons. They will have to be actual balloons of a reasonable size. Water balloons or small balloons won’t work. Helium quality balloons are the best. Patterned or metallic balloons are fun, and I love to use clear balloons, but plain balloons are fine too. There is a lot of variety in what people put in stress balls. Flour is the most common, and water beads, slime, sand, and play dough are also popular. But you can put almost anything in a balloon, just make sure it’s not so sharp it will pop the balloon, or anything that could mold or rot. Also, the balloon will probably eventually pop, and when it does it will probably make a mess. Stay away from things that will stain or be really hard to clean up, like oil or tie dye. A funnel or water bottle to get the filler in the balloon. Blow up your balloon and then let the air out. This stretches the balloon out. Put the end of the balloon on the funnel. Pour a little bit of your filler into the funnel. Do a little bit at a time so you don’t have a bunch in the funnel when the balloon is full. Hold the funnel upright so the filling goes into the balloon. If it gets clogged you can use a stick (Such as a chopstick or straw) to unclog it. When the balloon is full you can use a stick to push more filling into the balloon if you want. Pull the balloon off of the funnel. If there is filling in the stem of the balloon either pinch the balloon at the base and pour it out, or blow enough air into the balloon so that the filling goes into the base. Tie the balloon. This is my favorite method. It usually gets the most filling into the balloon, and is the easiest. Use a funnel to pour your filling into the water bottle. Pour more than you think you will need, but half the water bottle usually is enough for a normal sized balloon. Blow up the balloon and twist the stem so that the air can’t escape. Put the neck of the balloon on the water bottle, and then let it untwist. Turn the water bottle upside down and let the filling go into the balloon. Tap the water bottle if needed. When it’s all inside the balloon pinch the neck shut and take it off of the water bottle. Let the air out of the balloon, trying to do it slowly so that the filling doesn’t go everywhere. Tie the balloon. This one doesn’t require any extra tools, but is kind of harder. It only works with things you can hold, like slime. Hold the balloon open and stuff the filling in. I usually hold it with the first two fingers on my left hand and the third on my right hand, and stuff with the first two fingers on my right hand. If there is filling in the stem of the balloon either pinch the balloon at the base and pour it out, or blow enough air into the balloon so that the filling goes into the base. Tie the balloon. I like to double balloon my stress balls, because they do eventually pop. If they’re double ballooned they pop less easily, and when they pop they don’t make a mess. When one balloon pops it will pop easier, and will make a mess when popped. If you pop one balloon either throw it away or just double balloon it again. Cut all the stem over the knot on the main balloon off first. Blow up the second balloon and let the air out. Cut the lip of the second balloon off. Hold the balloon open and shove the first balloon in. Adjust the positioning if needed. I like to have the knot of the first balloon lined up with the end of the second balloon. Tie the second balloon and trim the excess. I like to draw faces and things (Emojis, pig faces, duck faces, Christmas trees, smiley faces, etc…) on the balloons. If the balloons or clear or have something else to make them look cool I’ll usually skip it. I made a chart of all the things I’ve tried making stress balls out of, with some notes about each of them, but this post was getting to long, so I made another post with the chart, which you can read here. Now go make a stress ball! If you make a stress ball or think of something new to put in one, I’d love it if you left me a comment telling me about it! This entry was posted in Words and tagged flour stress balls, how to make a stress ball, making a stress ball with a balloon, orbeez stress ball, slime stress ball, ultimate guide to stress balls. So apparently this never got posted, but I decided to post in anyway. This is the story for CWWC fourth challenge. I used all the prompts. The cake was for my fourteenth birthday, but what my cousin Chloe meant by the words was the cake was pretty. Chloe has a really weird sense of humor. It really was a pretty cake. It was in the shape of a circle, with white icing decorated with purple roses. It looked so pretty I didn’t want to eat it. However it was my party, I had just blown out the candles and both of my friends waited for me to cut it. I handed the knife to Chloe. She never spoke, never made a sound, but the look in her eyes told me what was about to happen. I thought it was going to be a balloon cake that popped when you cut it, (The actual reason I didn’t want to eat it) the same thing Chloe had made for my last three birthdays. It was a cake portal. I stepped through it and saw a girl drawing circles on a chalkboard. I tapped her on the shoulder. The girl dragged me into a huge ballroom style room. A long table extended across the length of the room. Cakes and deserts lined the table. I turned around to see Chloe and the rest of my friends grinning. “Her name’s Emerald by the way.” Chloe whispered. Emerald lighted fourteen candles, and I blew them all out, in one breath. We ate all the treats we wanted, until finally it was time to go home. Each girl picked her favorite treat to take home with us, and Emerald led us back to the room where we had come out. We stepped back through the cake. This entry was posted in Words and tagged cake, cake portal, Challenge, cousin, Creating worlds writing camp, Cwcc. So for years, as long as I can remember, we didn’t eat anything with preservatives, MSG, or chemicals. We don’t usually eat that way anymore, we eat mostly what we want outside of our house, but at home we still eat weird. Most of our food is all natural, organic, non gmo certified, and there is a whole list of things we don’t eat. I love to bake, but with the way we eat, recipes often have to be adapted, changed, or ditched entirely. We use coconut sugar or honey instead of white sugar, grind our own whole-wheat flour instead of using white flour, no food coloring, cornstarch, buttermilk, cake flour, sweetened condensed milk, corn syrup, cake mix, powdered sugar,. A lot of things are easily, or at least doably, substituted for. Fruits and vegetables often make good dyes, one part lemon juice, three parts milk (Or water even) works just fine as Buttermilk, cake flour can usually be replaced with normal flour, or a different recipe for the same thing without cake flour found. Recipes without sweetened condensed milk or corn syrup can usually be found instead of one that calls for those things. Cake batter from a recipe can be used instead of cake mixes. Sometimes powdered sugar can be replaced with sugar and flour, but not usually. Powdered sugar is hard to replace. Icing is the worst. I know people who think cake/cupcakes aren’t cake/cupcakes unless they have icing, but without powdered sugar, icing is REALLY hard. I’ve tried making icing other ways, but it’s hard without powdered sugar. Cookie dough icing and peanut butter icing both have powdered sugar in them, though I am going to try to make versions without. Jelly has pectin it in. Marshmallows are bad, though I’m not entirely sure why. I’m working on coming up with something to replace icing, which is hard, but I like the challenge. It’s hard when people don’t eat your food because it looks ‘weird’ but it’s really cool when you make something just as good or better as the ‘normal’ version, but completely safe and filled with natural things. This entry was posted in Words and tagged allergies, cooking without preservatives, icing without powdered sugar, my family eats weird. So today I am particapating in the lovely Julia Rose’s blog launch tour for her new blog Julia Rose Author. She also posts over at DollsNAll, where you might know her from. So I did a little interviewy thing, and here it is! I’m in Black, Julia in purple. First: Why did you decide to start Julia Rose? Julia: I started my blog to document my journey of writing, my wandering in written worlds (hence the tagline! ), and to share the joy of writing with the world! It’s my passion, and it spills into everything I do! I also want to glorify God in whatever I do – and that includes my blogging and writing! Second: What do you want people to know about your new blog? Julia: I want people to be encouraged, and I want them to learn from my mistakes. XD I want my blog to be enjoyable and welcoming. Plus, making new friends in the blogosphere is always so much fun.. I’d like to do writing related posts, with a few articles here and there, writing snippets once in a while, interviews, and maybe the occasional fun reading post (in which I insist EVERYONE reads Chuck Black’s books!). Third: Do you have an advice for people starting a blog different from a first one? Julia: Starting a blog is like starting with a fresh page (haha, literally if you’re a writer) and don’t give up. Don’t toss it aside. Press through and do your best! The beginning is often the hardest because you don’t see a lot of fruit out of it. But still, keep going and do it! And now for some snippets, because yay snippets! Julia: Aha! Snippet time! *rubs hands together evilly* I love snippet time. XD Let’s do some mixed-up Kernera snippets (just to get you thoroughly confused!)! She had but minutes to save herself and the child. Just as she reached Cheval Beau, a shadowy figure snapped the rope keeping him, leaped into the saddle and galloped soundlessly away. Cheval Beau tossed his head wildly, whinnying, and fear gripped her heart like an icy hand with clawing fingers. Anger continued to swell within the man as he reached the entrance of the cave. It used to be his comforting abode – the only place to return to as a haven during the chaos of the world. But when he had left abruptly…. Those three snippets are from the three short stories that make up my Kernera trilogy! I really, really love/loved writing those and you’ll have to keep watching my blog to find out the rest! So go read Julia’s blog to find out the rest of the story, and because her blog is awesome! This entry was posted in Words and tagged Interview, introducing new blog, Julia Rose, Julia Rose launch tour, launch tour. Yes, this is totally the sequel to the Christmas Eve and snow post. No one ever said (That I can think of anyway.) that posts shouldn’t have sequels. So last week’s snow did turn into a white Christmas. It’s stayed around ever since, and we have gotten a little more every few days and then a lot more Friday night. There are a few inches on the ground right now. This is what it looks like right now. I know this isn’t a great picture, but it was 10 degrees, (An improvement over this morning’s 3) and I didn’t particularly want to go outside and be cold. Even know we have had snow and freezing temperatures all week, I’m still not annoyed yet. I like snow. I just don’t like not being able to go anywhere because of it. It’s fun to play in, dance in, look at. I just hope it doesn’t stay around forever. Happy New Year’s Eve, and have a good year. This entry was posted in Words and tagged Happy new year, I still like snow, new years, new years eve, Posts about snow, Snow. It’s about 7:30 on Christmas Eve, and as long as I’m on my computer I should do something productive right? Gets me out of being social at least. Okay, so today I am going to talk about snow. It’s snowing pretty hard here right now. It might not be the first time in my lifetime we have had a white Christmas, but certainly the first time I can remember. I really hope it sticks and we get our white Christmas after all. Here is a picture I tried to capture of the falling snow. It’s not great, but I like it. I love snow. I love almost everything about it. I don’t care if I am not four, I will squeal SNOW!!! and run around in it. I love the sound of the snowflakes hitting the ground with soft thumps. I love how the snow dims the world into a white wonderland. I love being alone outside in the snow, hearing nothing but the world transforming. I love how the moonlight bounces off the snow in the dark. I love soft footsteps in the snow. I love feeling snow on my hair. I love seeing the unique snowflakes. I love waking up after a hard snow and seeing the white world. I even love being cold in the snow. When it snows, to me at least, the world becomes peaceful. As if nothing else matters. Just snow. Okay, there’s this year’s Christmas Eve post. Merry Christmas Eve, enjoy Christmas tomorrow, and remember the real reason for the season. Jesus. This entry was posted in Words and tagged Christmas, Posts about snow, Snow, Snowflakes, the white world, Winterwonderland. About a week, two trips to Lowes, and four hours of working on it, I had my swing. My family doesn’t really have a big backyard, only about three quarters of an acre, but some of it is wooded. We have worked with ropes many times. We have a ‘rope course’ consisting of ropes strung between trees different ways to walk on, which we redo almost every year. We have a rope swing hung from a tree three stories high. We had a tire swing (But it came down with the ropes course this year.) So a swing shouldn’t be too complicated. So I talked to my Mom about it. She told me that if I could find a tree she would help me put it up. When we came back from vacation I went on a hunt for trees. Most of the trees in the backyard are forest trees, growing straight up. I couldn’t find a tree with a good branch for hanging a swing. But when we put up the tire swing we didn’t have a good branch either. We hung rope between two trees and hung the tire from a rope tied to the rope between the trees. So we could do that instead. I picked out two trees on top of a hill in the back corner of the yard, where people rarely go. The perfect hideout. I brought my Mom back there, and she agreed that the two trees would work. Mom thought we could use some help, so I called Papa (My Grandpa) and asked him to help. He was going to come over on Saturday, but it rained. And then on Sunday he came over, but we had other stuff to do also and we didn’t get to it. So we found time on Monday, (Labor day, also the first day of school) and after school my Mom, Papa and I went up to the hill to work on it. They had gone to Lowes twice already and gotten the things we needed, but we had to drag it all back there, ladders, hammers, nails. They sent me up and down that hill several times. Instead of tying a rope between the two trees Mom and Papa tied two two-by-fours between the trees. They were going to tie them on either side of the tree, but they ended up nailing them together, and tying one end on one side of the tree, the other on the other side. Most of what I got to do was sit and watch them, which was very boring since it took about four hours, but it was worth it. When we had the wood up we went to make the seat. We were going to make two, one for the swing set that needed another swing. They had bought a fancy fixture thing to put in the seat and string the rope through, but we had to drill holes for it. One of the fixtures was the wrong size, which messed us up a lot, but I caught it, and only one of the holes had to be redone. Once we had the swing put together we tied rope to the wood and to the swing seat. We had to redo it several times, but finally it was done. The swing swings far, and is really fun. I was finally swinging on my swing when I fell off and hit my head on the wood seat. I didn’t swing again that night. But I’ve been on it every day that I had any time at all since. It’s hidden in the corner and no one bothers me, but they know where I am. It’s a great place to swing, but also to hang out, read a be. read a book, write in my journal or just think. I’m very thankful for my swing, and I know there will be many great times had on that swing for years to come. This entry was posted in Words. I know it’s been quite awhile since I’ve posted. Sorry about that. Hopefully that will change in the coming school year. Anyway I’m doing Loren’s CWWC and here is my story for the first challenge. I know it’s kind of silly, but it was fun to write. I used the things I wanted to say but never did prompt. There are some things you really want to say, but really shouldn’t. For example, you probably shouldn’t tell my brother Josh that he is wearing two completely different shoes, because he will sock you. You shouldn’t ask that lady on the bus how soon till the baby is due, because, contrary to most beliefs, she isn’t pregnant. Don’t tell your parents that you stayed up till five o’clock yesterday morning, because they will get mad and ground you. Actually, don’t tell your parents anything, because if they believe you, you will get in trouble. That’s the way it is for my parents anyway. Yeah, don’t tell your parents anything, it won’t work out very well. This rule was exactly why I wasn’t telling my parents that I was going out to hunt for watermelons. Wait, wait, before you laugh, I really do have a good reason for hunting the watermelons. We had a school assignment to find ten of a fruit and average the number of seeds. Each of us had a different fruit, I watermelon. So anyway, I decided to sneak into a watermelon farm and pick ten watermelons, because my Mom would never agree to buying ten of them. The first thing I had to do was get into the watermelon farm. I snuck out of the house at five in the morning, the perfect time as people were still asleep, and it was getting light. I put socks on, quietly crept down the stairs, unlocked the door, and, hopping on one foot and then the other while I put my shoes on, pulled the door shut. The watermelon farm was walking distance, and it didn’t take very long to get over there. I looked around, and deciding it was the best way, hopped the fence. My shoe caught in the fence, so I pulled the other one over, and tried to yank it out. When I finally got it, I tumbled down with a big crash into the watermelon field. At least finding the watermelon wasn’t a problem. I picked ten out, and quickly figured out I didn’t have a good way to get them home. I got five into my backpack, and struggled to carry the other five. I took my jacket off, stuffed them in there, and picked it up by the sleeve. I slung my backpack over one shoulder, and started to climb the fence again. But my hands were full balancing watermelon, and so climbing the fence was hard. I got one foot up, and finally decided to lower my jacket and backpack over the fence. I got across, picked the stuff up, realized I was being chased, and went running. And that’s how I fell off of a bridge. Into ten watermelons. When the woman came up I would have told her I was out on a walk, but I happened to be covered in watermelon, laying in the rinds. The woman tried to look stern, but she just ended up laughing. The woman introduced herself as Mrs Brown, owner of the watermelon farm. She took me back to her house, helped me clean up, and asked what I was doing. So I poured out the whole story. After Mrs Brown stopped laughing she forgave me. Then she helped me cut up ten watermelon and count the seeds. We put the leftover watermelon into the blender, and she blended it up for watermelon popsicles. I was very surprised she wasn’t mad. Soon, though I had to go home. She offered me a ride, but I told her I could walk. I snuck back into the house, and into bed. This, my friends, is why you don’t tell you parents stuff. This entry was posted in Words and tagged Challenge, Creating worlds writing camp, Cwcc, Watermelon, Watermelon farm, Watermelon story.